As Featured on the Travel Channel, The Haunted Hotel is San Diego's Premiere Haunted Attraction. The Haunted Hotel is full of spine tingling effects that are so real they'll make your skin crawl. This year, plunge into the depths of horror on the ALL NEW Hellevator, stroll down the dark, deadly Zombie infested alley and drudge through the muck and mire of the “wrong turn” hillbilly swamp. Hold on as the Mutant Mine Shaft is shaking and collapsing all around you, make your way through the Morgue Autopsy Lab and good luck in the Chaos Hallway! Where are the clowns you ask? It’s a SURPRISE! General Hours are Sun-Thurs: 7pm-11pm. Fri & Sat: 6pm-1am. Please check website for specific dates and times. In the Gaslamp Quarter at 4th and Market. Please check website for map. Don’t miss “Lights Out Wednesdays”!! As if it weren’t already scary enough, EVERY Wednesday the Haunted Hotel goes dark. 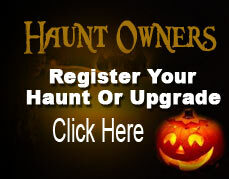 Find your way through the ENTIRE haunt in the dark with a free glow stick as your only comfort.